APPLICATIONS TO THE POSTS OF PRINCIPAL AND TEACHING POSTS IN THE ODISHA ADARSHA VIDYALAYAS IN THE STATE OF ODISHA-2019. 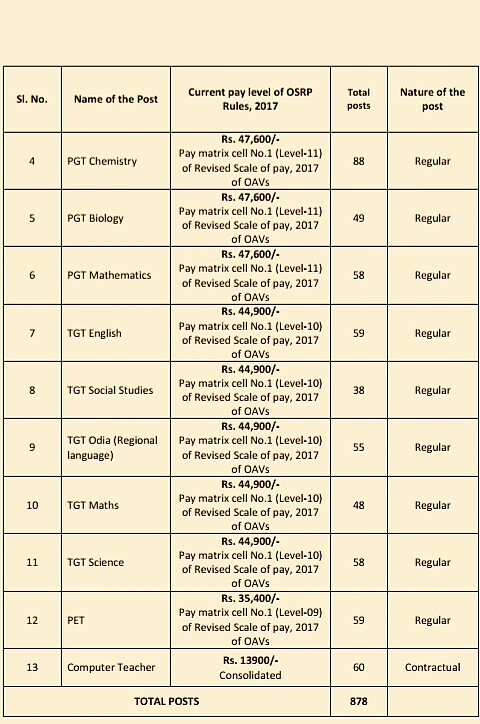 The Odisha Adarsha Vidyalaya Sangathan, Is Appointing Eligible Candidates To The Post Of Principal, PGT And TGT On Regular And Contractual Basis. So Interested Indians Can Apply For This Job Through Online Mode Within The Given Time Period. Total Number Of Vacancies →878 Online Vacancies, Kindly Do Check Out The Image's Below For Vacancies Distribution, Name Of The Posts, Scale Of Pay. (Credit- The Official Advertisement OAVS Recruitment 2019). B. Eligible Criteria For Odisha ADARSHA Vidyalaya Sangathan Recruitment 2019. Age Limit →AGE LIMIT AS ON 01.03.2019 The Date of Birth as recorded in the Matriculation/Secondary Examination Certificate will only be accepted in Online Application. No subsequent requests for change in date of birth will be entertained. a) For the post of Principal: Candidates shall be under 50 years of age and above 32 years of age as on the 01.03.2019. However, in case of SC/ST, Women, SEBC, Ex-military persons the upper age limit shall be relaxed by 5 years and in case of PH candidates the upper age limit shall be relaxed by 10 years. b) For all other posts except the post of Principal: Candidates shall be under 32 years of age and above 21 years of age as on 01.03.2019. However, in case of SC/ST, Women, SEBC, the upper age limit shall be relaxed by 5 years and in case of PH candidates the upper age limit shall be relaxed by 10 years. Age limit of Ex-serviceman shall be as per G.A. Notification No-22586/Gen. Dtd.16.10.1985 and Rules/guidelines of Govt. of Odisha in operation. Educational Qualifications →Candidates Must Hold Degree/Certificate In Concerned Discipline From Certified Board/University/Institute. Mode Of Examination/Selection Process →Computer Based Tests/Interview. Online Application/Examination Fee →a) All the Candidates are required to pay Fee as mentioned below to be deposited by the candidates through Online Fee Payment using Debit Card/Credit Card and Net Banking Payment Mode through ‘State Bank Collect’ Only: (i) Application Fee (non-refundable) of Rs. 1500/- (Rupees One Thousand Five Hundred Only) plus Bank Charges and Service Tax (as applicable) for the Post of Principal. (ii) Application Fee (non-refundable) of Rs. 1000/- (Rupees One Thousand Only) plus Bank Charges and Service Tax (as applicable) for Other Teaching Posts. For More Info →The Official Website OAVS. Now Apply For the posts of Principal and Teaching Posts in Odisha Adarsha Vidyalayas (OAVS) 2019.